By now you know, Adventive automatically creates a unique tag for each ad group or individual ad in an ad campaign. 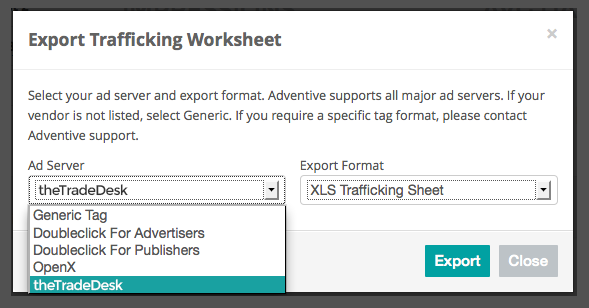 Adventive's new tag generator allows you to export the right third-party tag format, ensuring ads are distributed with the appropriate tag settings. To generate tags for your campaign, just select an ad server or DSP. Adventive supports all major first-party ad servers including DoubleClick for Advertisers/DFA/DCM, DoubleClick for Publishers/DFP and OpenX and DSPs like theTradeDesk. Once you've chosen an ad server or DSP, select your export format–either Excel XLS or CSV–and you're good to go. Check it out and let us know what you think.